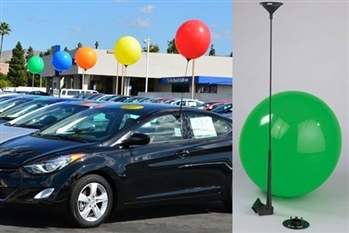 Finally, a way to eliminate the cost of helium and short term latex balloons! These innovative holders will last months, not days. Two-Piece Holder with quick turn release allows easy separation from the window clip. Each kit includes one Balloon Adapter Clip and a Two-Piece reinforced Balloon Holder. Clip-on car window holders are 30" tall and made of fiberglass and reinforced plastic. Balloon Adapter Clip is necessary to attach balloon to holder.